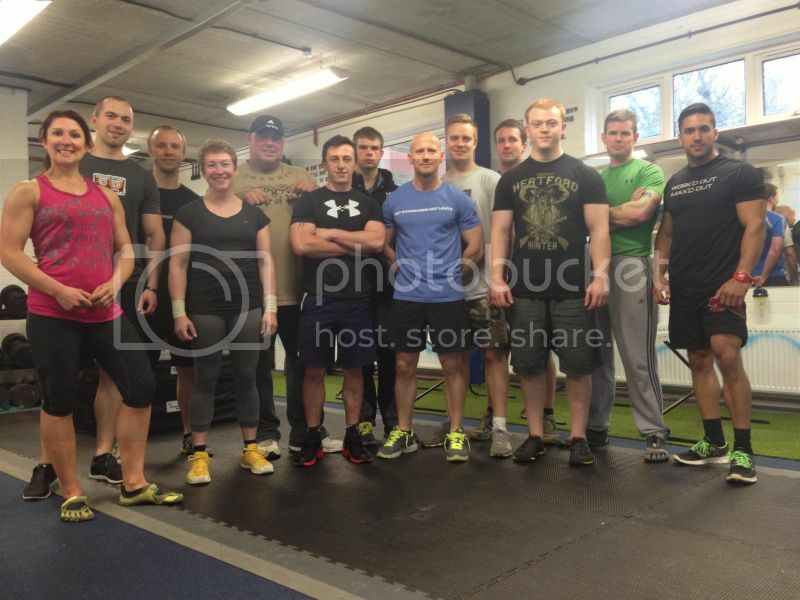 Last Sunday I took a trip to The Training Lab, the home of Andy 'Ironmac' McKenzie for a strength and power workshop, co-hosted by legendary Powerlifter Andy Bolton. First time I met Andy M was a few years back at a strength and power event, where Andy dominated the sub-75kg class to win the event. This was proof enough that I wanted to train with and learn from him, so I booked up for this workshop. And being a novice powerlifter, the idea of working with such a strong lifter like Andy Bolton made it a no brainer. The Training Lab sits on the grounds of East Grinstead rugby club. It is a great facility, kitted out with so much awesome equipment that I wish I lived closer! The workshop was intentionally kept as a small group, to ensure that both Andys had time to help out everyone, which worked really well. From the outset I knew it was going to be a tough day. Arriving 3 minutes late at 10:03, Andy M suggested a 30 burpee punishment - thanfully he did not follow through with this but it set the tone for the day ahead. The day went on until 17:30 with only 30 or so minutes for lunch, so it was quite full on. The first segment of the day was to do with warm up. As my training is normally first thing in the morning, I admit this is an area of training I neglect due to time. This part was led by Andy M, who took us through various running and jumping drills, and some band work to try and activate the glutes and shoulders. Got some very good ideas from this and I will be putting these ideas into my training going forward. Despite being a 'warm up' Andy put us through our paces and I was very happy when we took a short break! The second segment was also run by Andy M, and was about explosive power. Lots of knee jumps, box jumps, upper and lower body plyos. All very fun and very well thought out. As a powerlifter I always think about brute strength, but never really about explosive power. Both Andys made me rethink that during this segment, and I realised how it can benefit my lifts. After a spot of lunch, the afternoon session began to focus on lifting, and led mainly by Andy Bolton. As someone who has squatted over 1200lbs and deadlifted over 1000lbs, I was eager to learn from him, and he didn't disappoint. It's not everyday that an opportunity to train with someone like Andy comes about. We began with squat, the king of all exercises. Andy taught us the powerlifters squat - wide stance, toes out. This is something new to me, but will now become the norm for me when squatting. We worked in small teams on box squats, and I worked up to 150kg. This is the most I've ever had on my back, so I was chuffed to complete the lift, albeit a little wobbly on the way up! Next we moved onto deadlift. Focus on slow up to the knees then explode. Something I'd never done before, but found it useful. Even pulled a 5kg pb at 185kg! I'll definitely take away the idea of training deadlifts at sub maximal weights with a focus on speed - if it works for Andy Bolton it will work for me! We finished with some complexes led by Andy M. By this time I was pooped, but gave them a good go. Andy introduced the concept of French Contrast training. Essentially 4 exercises done in sets concurrently, starting with a heavy compound exercise (like squat) followed by a plyo exercise (like hurdle jump) followed by lighter compound exercise (like weighted squat jump) finishing with another plyo (like quarter squat jump). An interesting concept I need to try in a session on its own when I am fresh. Come 17:30 I was knackered! I was ready to head home via somewhere for some coffee! We got a little goodie bag at the end with some Kinetica whey protein, a Core 150 shaker, and a Muscle and Fitness magazine. Great day, learnt a lot and saw some awesome lifting by others. Muscle and Fitness magazine were in attendance so sure there will be a video up somewhere soon. Hope to be back to the Training Lab in the future.